Tarun Grover, 44, was unaware the bulge on his lower abdomen would require a check-up until, one day, he couldn’t bend over due to the pain near his groin. He decided to consult Dr. Amarchand S. Bajaj, Senior Consultant, General & Laparoscopic Surgeon at Sitaram Bhartia Hospital, Delhi for advice. After Tarun’s physical examination, a diagnosis confirmed an Inguinal Hernia. Here are some doubts Tarun decided to clarify at the consultation. “An Inguinal Hernia is a condition where the lower abdominal muscles (of inguinal area) weaken over time and the contents of the abdomen, usually the small intestine and omentum (fatty content), manage to push through,” said Dr. Bajaj. Have questions about inguinal hernia treatment but can’t visit us in Delhi? Get your questions answered through a video chat with our doctor. Enter your details below and wait for us to call you through whatsapp tomorrow between 2 -4 pm. This offer is only limited to residents of Delhi-NCR and nearby cities. How serious is an Inguinal Hernia? This condition may not be dangerous immediately, but an Inguinal Hernia does not heal on its own. Without treatment on time, life-threatening complications may arise. What is the main cause of Inguinal Hernia? Tarun wondered if anything he did could have contributed to his condition. The doctor assured him that in some cases the causes behind Inguinal Hernia cannot be determined exactly. An increase in abdominal pressure caused by chronic cough, chronic constipation, urinary problems due to BPH (Benign Prostatic Hyperplasia) etc. Tarun was advised surgical treatment at the earliest as his condition could worsen without timely intervention. “Do Inguinal Hernias always need surgery?” asked Tarun. Dr. Bajaj urged him to keep in mind that surgery for Inguinal Hernia is the only option as it cannot be managed using non-surgical or medicinal methods. Hernia operation is carried out using a minimally-invasive method (MIS) that results in fewer and smaller cuts. This keyhole or laparoscopic method is preferred as it is more specialized than open surgery and reduces the post-operative morbidities such as discomfort after surgery. “How long does it take to recover from an Inguinal Hernia?” Tarun further questioned. Tarun seemed visibly reassured after Dr. Bajaj’s counselling. He realised delaying the surgery could cause more harm and agreed to go ahead with the surgical procedure. After a successful surgery, Tarun experienced a speedy recovery and was back on his feet within a few days as expected! Just like Tarun, Mr. Shamsu had been suffering from pain and swelling in his groin area for days before he decided to seek Dr. Bajaj’s medical opinion. 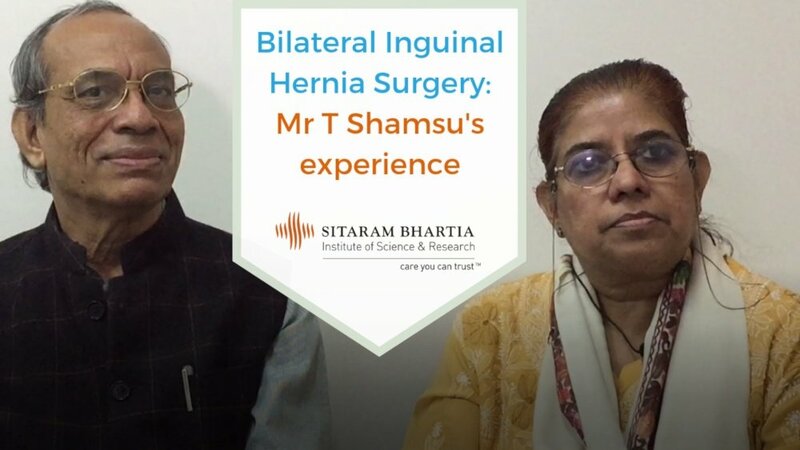 Pleased with his advice, here are Mr T Shamsu and Dr Shakila Shamsu talking about their experience at Sitaram Bhartia Hospital!